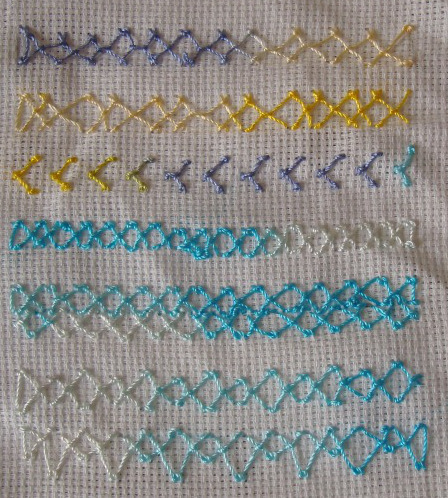 6.In these samples, I tried isolating this stitch and working them in diamond and square shapes. 7.The same isolated diamond stitches are worked in the first row, the starting point of the following stitch is inside the preceding stitch. 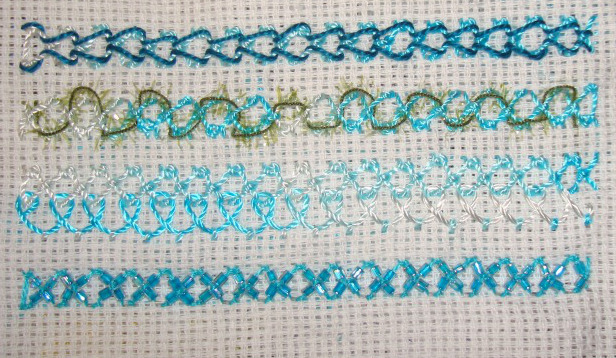 I tried working two diamond stitches together to form a broad seam, I got this idea from looking at Annet’s samples. 8.The diamond stitches are worked at angle in these rows, first row is to the right and the second row to the left. 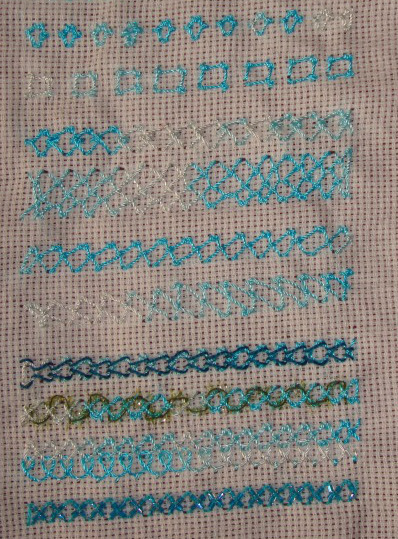 In these samples, I took an effort to stitch by angling the needle, whereas when I started this sampler, the stitches themselves angled in all directions-LOL! While I was struggling with this stitch at the beginning of the sampler, the thought was to work some stitch combinations through which this stitch could also be practiced. But after the practice, I wanted to explore this stitch. Which made this exercise quite interesting. I experimented this diamond stitch with other TAST stitches today. 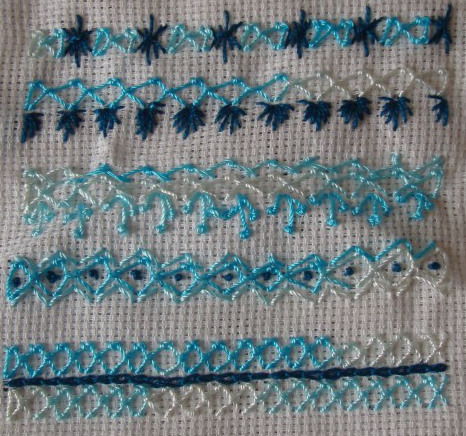 3.The first row is with sheaf stitch and the second row is with Algerian eye stitch variation. 4.Two stitches were combined with diamond stitch in these samples. The first row the stitches are Breton stitch and pistil stitch. The second row was worked with two rows of arrowhead stitch and French knots. 5.Chain stitch line is worked between two rows of diamond stitch in this sample. This week’s stitch on the TAST 2013 challenge by SharonB is diamond stitch. I had attempted it during the previous TAST challenge. I couldn’t make a neat work of the stitches then, and this struggle is continuing in this sampler too. 1.I started the first row to try this stitch first and found that learning this stitch is an ongoing process. LOL! I tried working alternate diamonds [!] nearer to each other in the second row. Then thought working all the four knots together could be the problem and tried three knots in the third row. 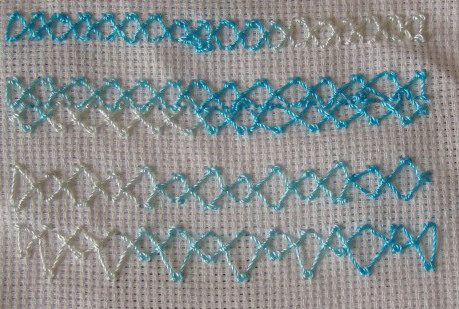 2.Smaller version of diamonds are worked in the first row, two rows of diamond stitches are worked together in the second row. Small and large diamonds are alternated in the third row. And the diamond stitches are worked with varying heights in the fourth row. I’ll try some stitch combinations, while practicing this stitch.